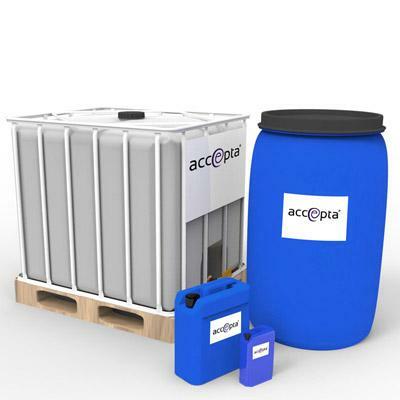 Accepta 2346 is a high-performance speciality acid developed to reduce the pH of water in closed systems. High pH in closed water systems may be caused by a number of factors including excess alkalinity levels in the feedwater, or by the excess addition of certain types of corrosion inhibitor chemicals. Whilst it is usually desirable to maintain treated closed system waters in the alkaline pH region to enhance corrosion protection, care needs to be exercised, because certain metals such as aluminium and copper may deteriorate when the pH of the treated system is too high. Accepta 2346 has advantages over the use of other commonly available acids because it does not add any corrosive neutralisation salts to the system, and has a buffering capacity making it easier to achieve the target system pH without over-correcting. The neutralisation products that are created through the use of pH conditioners will, in fact, enhance the protection against corrosion and scaling within the system. High performance speciality acid to reduce pH in closed systems. Does not add corrosive neutralisation salts to the system. Improved buffering capacity makes it easier to achieve the target pH without overcorrection. The required dosage rate for Accepta 2346 is best determined by the addition of a dilute solution to a sample of system water in the laboratory, and extrapolating the quantities to adjust the system pH to the required value. We would recommend adding 80% of the volume determined by testing and allowing this to circulate, before testing the system pH and then adding the remaining 20% (if required). In most closed systems it should be possible to introduce pH conditioner via the dosing pot, this is safe to do provided that there is no contact of the product with concentrated residues of system inhibitors. Note – Accepta 2346 should NOT be mixed with other water treatment products in concentrated form.